China regulators hit automakers -- with a notable focus on foreign companies -- with anti-monopoly probes this year, prompting Toyota, Honda, Chrysler, BMW, Audi and Mercedes-Benz to lower prices on vehicles and spare parts. WUHAN, China -- China’s once blistering auto sales growth has cooled significantly this year, damped by a slowing economy. That was just one of several concerns fretted over by Chinese and international executives at the Global Automotive Forum, which opened here Thursday. A shrinking market share for domestic brands. A dearth of local innovation in technology and design. Tightened regulations to combat pollution and congestion. Increased competition in aftermarket parts and used cars. A government crackdown on alleged price manipulation by automakers. 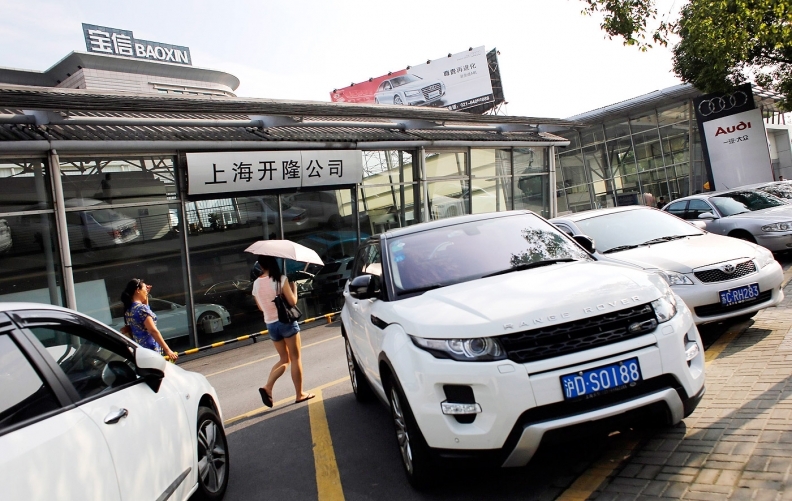 The annual conference on China’s auto industry convened just days after the China Association of Automobile Manufacturers said total vehicle sales rose a mere 3 percent in September, their smallest gain in 19 months. For the first nine months of 2014, total sales rose 7 percent. But that compares with a 14 percent gain for all of 2013. “China’s auto industry is at a crucial transformation point,” said Wang Xia, chairman of the automotive committee at the China Council for the Promotion of International Trade. Part of what worries government apparatchiks: Their grand gamble on technology transfer isn’t working. Foreign carmakers were required to form joint ventures with local partners to manufacture here, in the hope that some of their world-class technologies would trickle down to local brands. Instead, the global brands gained share at the locals’ expense. One reason was a lack of technology and styling among the local brands. They couldn’t compete, partly because they didn’t have a high-tech, innovative supplier base to lean on. “That technology transfer never really took place,” said Jay Kunkel, Asia-Pacific president at the U.S. supplier Lear Corp.
Overseas suppliers now see an opportunity to sell more advanced technologies, such as electronic stability control systems, to Chinese brands. But even as they do, the big global carmakers stay one step ahead by loading vehicles with next-gen gadgets. All the while, local brands and international ones alike are getting squeezed to roll out greener cars to meet China’s increasingly stringent emissions standards. That adds further pressure to innovate with such advanced technologies as downsized, turbocharged engines or electrified drivetrains. Meanwhile, standstill congestion in China’s big cities has prompted local governments to invoke license plate quotas. Yet even as such regulatory constraints rein in sales, automakers are piling into China with plans for yet more factories. General Motors, for instance, said this month it will invest $14 billion through 2018 to open five more assembly plants in China, adding just under 5 million units of output. “China is plagued with excessive production capacity,” bemoaned Zhang Xiyong, general manager of Beijing Automotive Industry Holding Corp., which partners with Hyundai Motor Co. and Daimler AG. Other trends such as used-car sales likewise take the shine off a market where the average sale used to be a customer’s first. They also present revenue streams to tap, including financing for an emerging buy-on-credit generation and aftermarket services for an aging vehicle population, including spare parts and repairs. Yet even those avenues are fraught with potholes. China regulators hit automakers -- with a notable focus on foreign companies -- with anti-monopoly probes this year, prompting Toyota, Honda, Chrysler, BMW, Audi and Mercedes-Benz to lower prices on vehicles and spare parts. They also fined several Japanese suppliers for bid rigging. Foreign executives at the conference said the crackdown may be partly politically motivated to help flagging domestic players. But BAIC’s Zhang called it a double-edged sword. It will create a more level playing field, he said, but it also will intensify the competition as foreign rivals’ prices come down.